We saw another Nepenthes that is different than the others we saw in the higher highland areas. It has small pitchers slightly similar to N. tentaculata, N. tobaica and N. gracilis but tougher and thicker. The pitchers are always nicely colored with blackish lines and markings similar to N. fusca. There was very little variation with this species as all mature plants had ample rosettes on the ground and also at intervals up the stem. The stems were climbing [sic] up to about 7 meters and had upper pitchers similar in color and shape to the lower pitchers but with the usual differences. The male inflorescences were about 20 centimeters, peduncle inclusive. Prior to a formal description, Nepenthes mikei was known as N. minutissima among growers. This name is a nomen nudum, or “naked name” – a placeholder used until a formal description occurs and proper name prescribed. 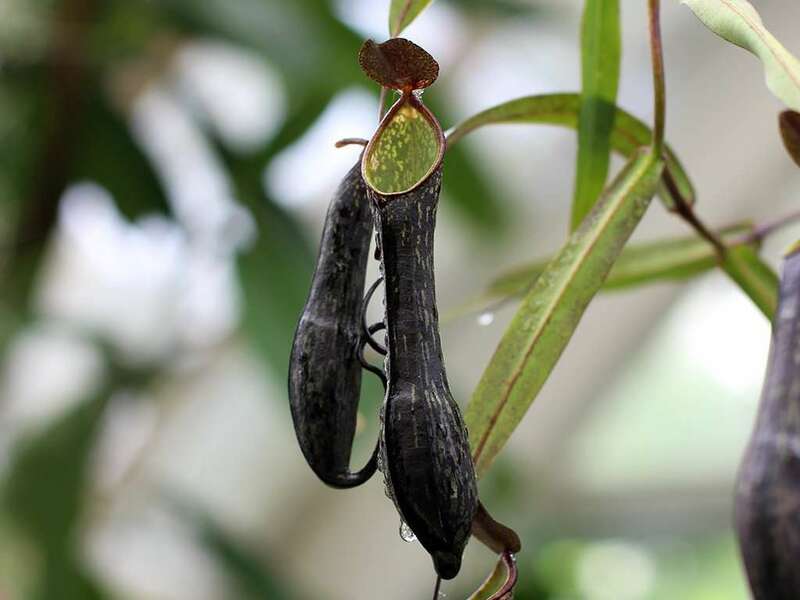 Ricky Maulder and Bruce Salmon formally described Nepenthes mikei in a 1995 issue of the Carnivorous Plant Newsletter. The herbarium specimen B.Salmon & R.Maulder 221719 is located at the Auckland Institute and Museum in New Zealand and is the holotype, or singular specimen used as the definitive example of a given species at the time of its description. The sacrificial holotype plant was prepared in 1995 from a specimen cultivated in New Zealand, and includes a vine with a rosette, a lower pitcher, and a female flower. Nepenthes mikei has small pitchers that take on a purple hue so dark, it almost looks black. Contrasted against this is a speckling of green on the outside of the pitcher and a fully green pitcher interior. The peristome is very narrow and also green. In upper pitchers, the peristome can take on a reddish tint, fading from red to a pale green. Tendrils also darken from a lighter red to dark purple as they approach the connection point and digestive zone of the pitcher. Wings are present in larger lower pitchers, and fade away as more delicate intermediate and upper pitchers form. Petioles are narrow, and maintain a constant width along their length of about 4 inches (10 cm). 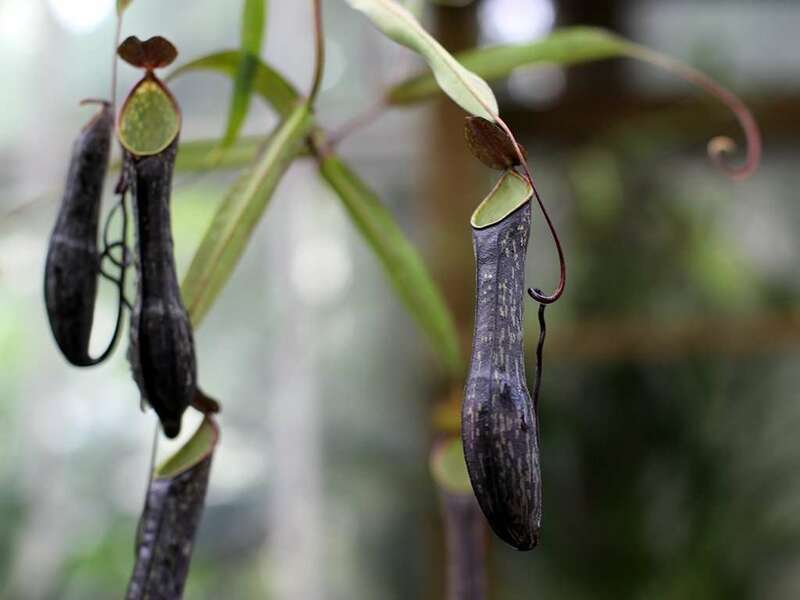 The plant has a climbing, vining stem, growing up to about 23 feet (7 meters) and internodal space between petioles increases to about 3.5 inches (9 cm) for upper pitchers. We suspect that it [N. angasanensis] may prove not distinct from N. mikei and here treat it as a synonym. Some folks think that Nepenthes angasanensis may, in fact, be a naturally occurring hybrid between N. tobaica and N. densiflora. Either way, there’s one thing we can all agree on; N. mikei is a sweet tropical pitcher plant!